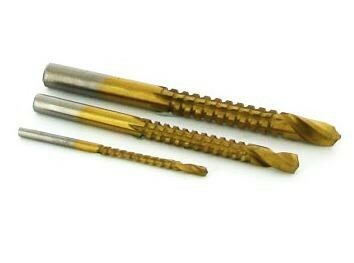 The Drill saw bits are designed to Drill, ream, file, rout and cut wood, plasterboard, plastic and aluminium with this 2-stage saw bit. Use the drill part of the bit to drill the starting hole, then use the milled shaft with specially designed teeth to cut the material. Quick, clog-free cutting. Titanium-coated and high speed steel.